Millions of people suffer from missing or damaged teeth due to aging, tooth decay, injury, or advanced gum disease. Fortunately, our high-quality dentures in West Chester can help you regain your smile’s look and function. Getting new dentures is typically a multi-step process. At your dentures appointment, your dentist may take impressions or measurements of your mouth to ensure the new appliance replicates your bite. If there are damaged teeth where the denture will be placed, they will need to be extracted. You’ll wear a temporary appliance as your mouth heals. If you dentist has selected an implant-supported denture, the implants will be set in place during a separate procedure. Once the permanent denture has been created, you will return to the dentist for a final fitting and adjustments. Today’s modern dental technology has allowed dentists to offer multiple types of dentures in West Chester. If you’ve decided to restore your smile, contact us today to explore the following options for affordable quality dentures. If you are missing multiple teeth in your upper or lower jaw, a full denture may be right for you. These devices can be used as upper or lower dentures, and they can be secured in place using bonding agents or titanium implants. Full dentures are created using a variety of materials, including durable porcelain and metal. The appliances can be removable, which means it rests on the gums, or fixed in place with dental implants. Your denture must be removed every night for cleaning. A partial denture is recommended for those who have healthy teeth remaining. Partials are used to replace one or more missing teeth. Like a bridge, partials are held in place using clasps that are fastened to adjacent teeth. The device can be removed for cleaning by unhooking the clasp. Unlike traditional partial dentures, flexible partials do not have metal clasps or rigid materials. Instead, they’re constructed with a lightweight, pliable material for a realistic look. They’re comfortable and discreet, helping you feel confident while wearing your device. While traditional appliances are held in place by bonding agents, implant-supported dentures are secured using one or two pairs of implants. Dentists typically suggest an implant-supported denture for the lower jaw, since the upper jaw usually doesn’t require the increased stability. Like a traditional denture, you’ll remove your implant-supported device every evening for cleaning. How Much Do Dentures Cost at Our Practice? Dentures vary widely in cost, with several factors determining your final charges. The amount of preparatory treatment needed, the style of denture chosen, and the materials used to create the appliance will all factor into your total cost. If you’d like to learn more about our affordable quality dentures and payment options, contact us today. 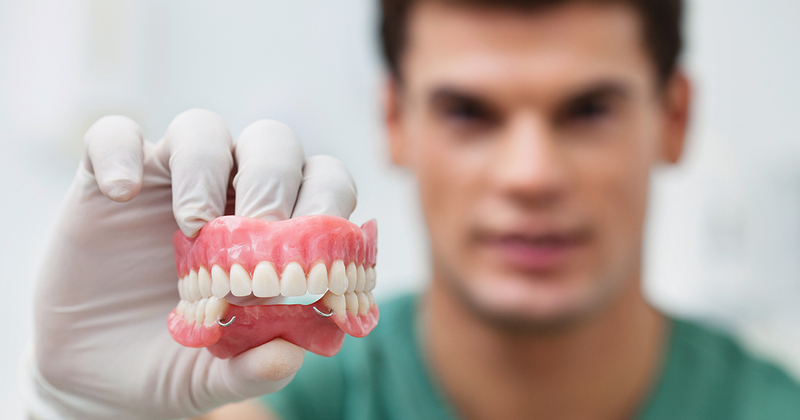 A denture is an excellent solution for teeth that are missing due to age, decay, or injury. These custom-made appliances include artificial teeth that are attached to a sturdy frame or implants. Wearing a denture can greatly improve your confidence and quality of life, making it easier to chew and speak. Sometimes, constant denture wear can cause sore spots to develop in the mouth. If you’re experiencing discomfort, ask your dentist about a soft reline. During this affordable procedure, your dentist relines your appliance with a soft, pliable material. Afterward, your dentures should be much more comfortable to wear. What Is the All-on-Four Dentures Technique? An All-on-Four denture is a great choice for those who desire greater biting power and enhanced denture stability. During this treatment, your dentist affixes a denture to four dental implants in the lower jaw. If you’d like to learn whether the All-on-Four treatment is right for you, get in touch with our office.